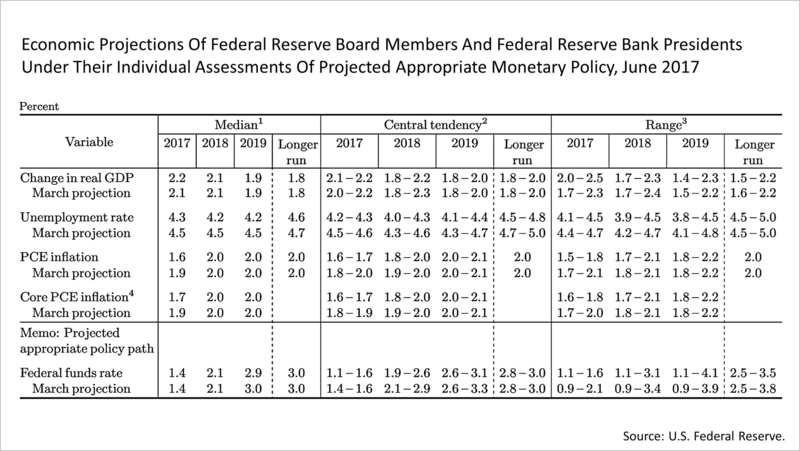 The Federal Reserve Board's economic experiment entered a new phase based on last week's release of the central bank's forecast through 2019. 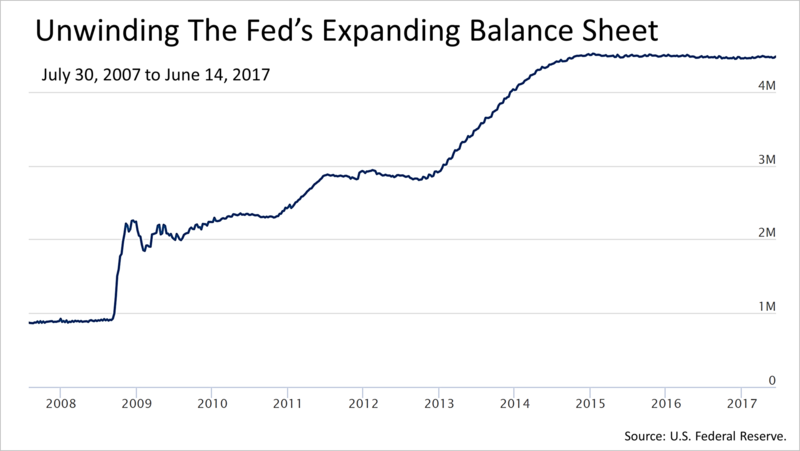 Since the beginning of the financial market turmoil in August 2007, the Federal Reserve's balance sheet has grown significantly from $869 billion, on August 8, 2007, to well over $4 trillion in June 2017. This is part of a grand experiment in the way a central bank manages the economy. The Fed bought long-term bonds to keep their prices high and their yields low, a program called "quantitative easing." QE was a new way for a central bank to stimulate the economy. It was never done before. The experiment worked. The Fed has put the economy on a stable long-term growth trajectory. Now, however, the Fed is embarking on the unwinding of its inventory of long-term bonds. The unwinding is expected to take years and will hurt bond prices as the Fed slowly sells its huge inventory of bonds. The Fed's unwinding program is a delicate operation because the Fed could make a mistake and accidentally trigger a recession. All of the recessions since World War II have been triggered by a policy mistake by the Fed. The mistake causes long-term bond yields to go too low versus short-term yields. The difference between long and short bond yields is shown here, and it is known as the "yield curve." 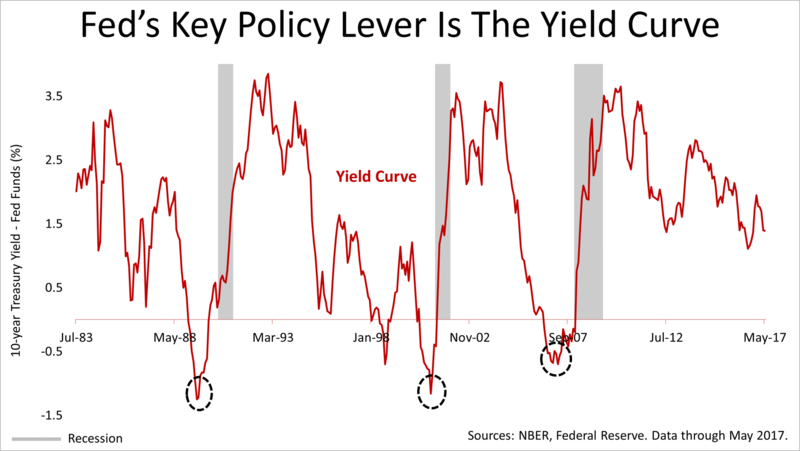 The dashed circles indicate periods when the yield curve flattened, when the long-term yields on bonds are the same as yields on short-term bond or less, which causes recessions. Going forward, this is the key data point to watch. If the Fed gets too aggressive and flattens the yield curve by raising short-term rates too much or allowing long-term rates to fall too fast while unwinding its massive inventory of bonds, it could cause a recession and a bear market in stocks. The Fed's economic projections, released on June 14, offer a clear glimpse into the future of how the unwinding program is expected to unfold, according to the central bank's plan. The Fed raised its March projection for growth in 2017 from 2.1% to 2.2%. The Fed also reduced, by a smidge, its forecast for unemployment for 2017, 2018, and 2019, and cut its inflation projection from 1.9% to 1.6%. 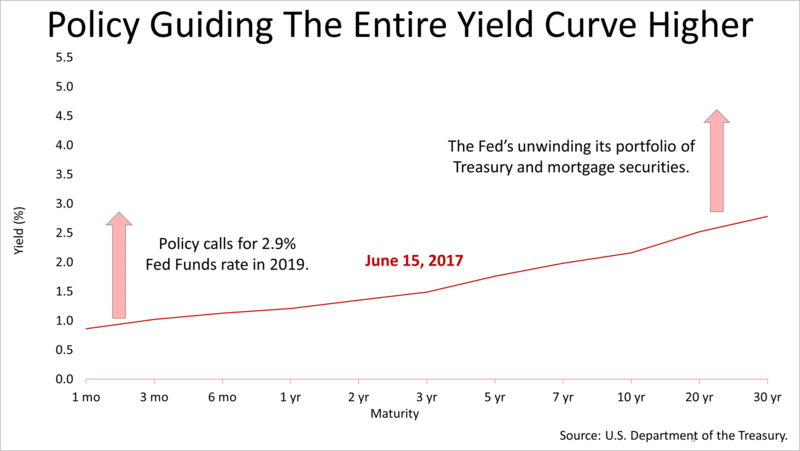 These projections are determined largely by the Fed funds rate, which is how the central bank controls short-term interest rates and where the central bank's policy meets the economy. For 2017, the Fed set a Fed funds target rate averaging 1.4% for the year and moving it up to an average of 2.1% in 2018, and then to 2.9% in 2019. The Fed, on June 14, raised short-term rates a quarter of a point to a range of 1% to 1.25%, and its forecast for growth on the economy and on low inflation puts the central bank policy on course to ratchet long-term bond yields to rise commensurate with short-term yields in the months ahead. The outlook for bonds, thus remains poor. 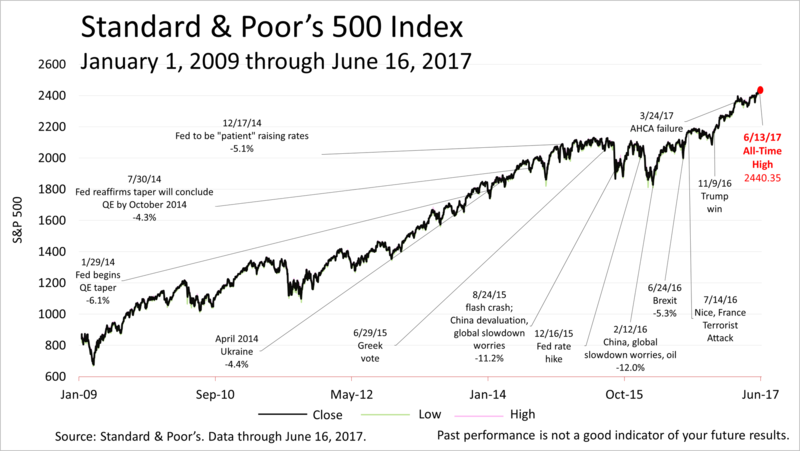 The Standard & Poor's 500 index closed at a new all-time high this past Tuesday at 2440.35, and on Friday, it closed at 2433.15. While the stock market could experience a 10% or 15% correction at any time, the fact that the S&P 500 stayed near its all-time high after the Fed released its latest projections for managing the yield curve, unwinding the stimulus program while keeping inflation in check, indicates that investors have confidence in the Fed's ability to successfully complete its historic experiment with new tools for managing economic cycles. The interest rate on the 10-year Treasury bond (long term) minus the fed funds rate (short term). Minutes of the Federal Open Market Committee, Meeting of June 13-14, 2017. Federal Reserve projections released June 14, 2017. 1% "neutral rate" plus 2% inflation, per Janet Yellen's March 3, 2017 speech.